White Tea with Ginger: up front you'll have notes of white tea, lemon, ginger & bergamot, followed by rose nutmeg, & geranium; then some musk & berries. Absolutely wonderful! Our lotion bars are made from all natural ingredients. They may be used daily to moisturize dry and cracked areas all over your body, from head to toe. The oils and butters penetrate deeply into skin within minutes after application. The beeswax seals the moisturizers in, leaving your skin with a soft, smooth feeling. Great on hands, cuticles, elbows, feet, etc. Try our lotion bar and you&apos;ll be pleasantly surprised at how much nicer your skin feels after only several applications. By applying our lotion bar to your feet, the beeswax will actually coat and seal your foot, so that you won&apos;t experience that skid in the shower or tub the next morning. 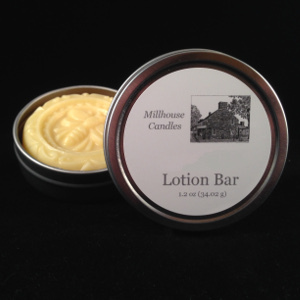 In addition, we have found that our lotion bar will not stain clothing, sheets, pillow cases, or other linens. Ingredients include 100% pure beeswax, cocoa butter, shea butter, sweet almond oil and fragrance. Our attractive honeybee lotion bar is packaged in a 2 1/2" round tin. Click here to see more events, past and future!